Our client – a US top 10 optical retailer was spending significant dollars on promotion and media budgets in local markets in pursuit of aggressive growth plans in the U.S. As plans were being made to expand distribution to new markets, senior executives required greater decision support on how much to budget for promotion versus media across local markets. Should less money be spent on promotion and more on brand media advertising to generate growth in local markets? Which promotions and media are high contributors to sales historically across all markets? How do media and promotional dollars be optimized locally across top 10 key markets? What is the ROI on media and promotional spend and how can it be maximized going forward and still meet sales objectives? 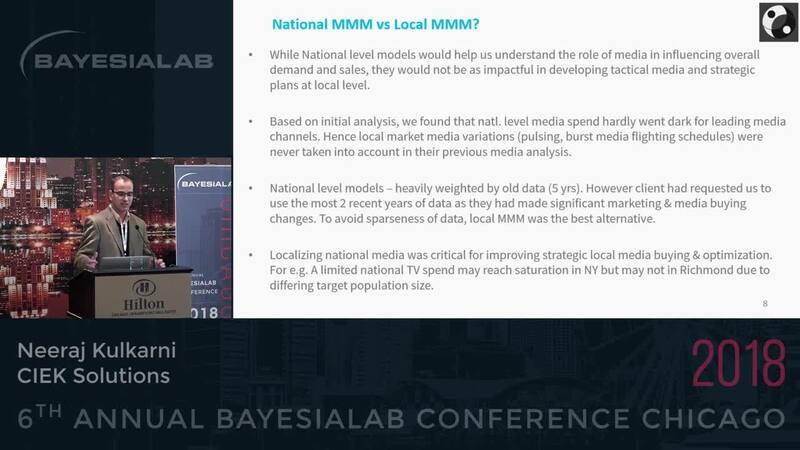 The presentation highlights the use of Bayesialab as the primary software for understanding causal relationships among media and promotions at local market level. We also used additional open source programming softwares like R/python for data aggregation and running scenarios to optimize promotional and media budgets. In 2015, Neeraj founded CIEK where he is currently President. He leads all facets of the company that helps clients optimize marketing investments by integrating experiential knowledge with historical data to create actionable, predictive strategies and predicts business outcomes with certainty. In 2017, CIEK was also recognized as one of the rising innovative companies in the VA/DC area. Prior to starting CIEK, Neeraj led analytics and data strategy for powerhouse advertising agencies like The Martin Agency and Havas. He has also led major strategic domestic and international engagements with numerous Fortune 500 companies, including retail, CPG, transportation services, credit and financial services and travel and hospitality. He is also currently on the board of 2 stealth start-ups in the media and marketing technology space. You can connect with him on LinkedIn, follow him on twitter or contact him to set up a time to chat.